Wednesday, October 21, 2009: Derry, New Hampshire — HomeAdditionPlus.com announced today its new Asphalt Driveway Paving Bid Sheet, a comprehensive checklist assisting homeowners in obtaining quality paving contractor quotes and hiring reputable paving contractors. Checklist questions compiled in a “Request for Quote” format that homeowners provide to paving contractors for bidding on their project. The 15 page, Asphalt Driveway Paving Bid Sheet’s checklist contains over 50 questions on all aspects of driveway paving. A primer on asphalt paving to enable homeowners to understand contractor responses to the checklist section. Specific topics addressed in the primer section include removal of old asphalt if necessary, site preparation, installation of sub-base and base layers, application of asphalt hot mix layers, aggregate compacting, driveway sealing and maintenance. The bid sheet also covers time intervals, workman’s compensation and liability insurance coverage, debris disposal, reference checks, and estimated paving costs and payment schedules. Critical information and tips for homeowners on how to work with a paving contractor in order to ensure their driveway is paved to their complete satisfaction. 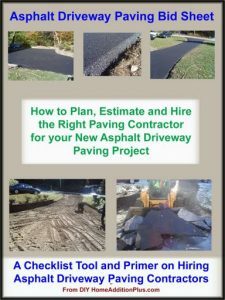 The “Asphalt Driveway Paving Bid Sheet” is an inexpensive and invaluable tool for helping homeowners quickly understand what key elements to look for in a quality paving contractor bid and hiring a reputable paving contractor.” said Mark Donovan, CEO of DIY HomeAdditionPlus.com.